Panthers quarterback Cam Newton suggested for the first time Wednesday that race may play a factor in why he’s become a lightning rod for public criticism. “I’m an African-American quarterback that scares people because they haven’t seen nothing that they can compare me to,” said the 6-foot-5, 245-pound Newton. The No. 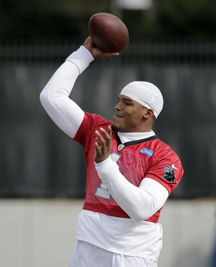 1 pick in the 2011 NFL draft out of Auburn, Newton has his share of detractors who either don’t like how he plays, his celebrations or his abundance of self-confidence. Newton, a leading league MVP candidate putting up record-breaking numbers, said he learned a long time ago that he can’t please everyone. “People are going to judge, and have opinions on things I don’t have control over,” Newton said. The stout and speedy Newton is beating teams with his arm and his legs, throwing for 35 touchdowns and running for 10 this season. He has helped lead the Panthers (17-1) to their first Super Bowl since 2003. Carolina plays the AFC champion Denver Broncos on Feb. 7 in Santa Clara, California. Newton acknowledged being leery of talking about how others may perceive him. “I think it’s a trick question,” Newton said. “If I answer it truthfully it’s going to be ‘Aw, he’s this or that.’ But I will say it anyway. Newton said he hasn't changed, and has previously responded to his critics. Panthers coach Ron Rivera doesn’t believe Newton should have to fight perceptions about race. Rivera, who is Hispanic, said he has battled that notion to some degree himself. Rivera said some people may simply not like Newton because of his personality. The All-Pro quarterback plays the game with open enthusiasm, pointing his arms forward after running for a first down, doing the “dab” in the end zone and pretending to rip open his shirt like Superman. He gets his teammates to pose for pictures on the sideline near the end of games when the outcome is no longer in doubt. None of that bothers Rivera, who said Newton needs to remain true to himself. Newton’s teammates have their own theories about the anti-Newton uproar. Panthers cornerback Charles Tillman said it may be because Newton wins in an “unconventional way,” unlike a traditional NFL quarterback, and fans aren’t used to that on Sundays. Tillman likens Newton, in some respects, to Tim Tebow. Carolina defensive tackle Dwan Edwards senses the hatred of Newton stems from the QB's popularity.